Get Daily Quote now to start your day in an inspirational way! 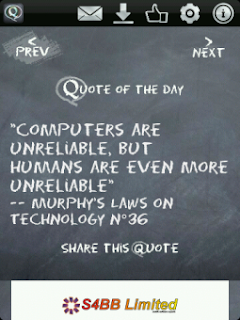 Daily Quote gathers a collection of witty quotes and delivers to your BlackBerry instantly. 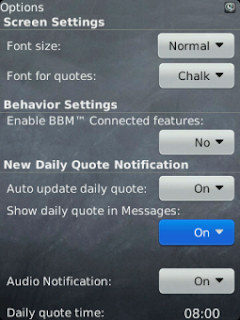 You can share your favorite quotes through BBM, Email and SMS. 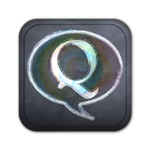 Also new are the improved graphics and the Options page where you can customize Daily Quote. This is a BBM connected application. Quotes are available in both English and German.